NOTE: Do not wipe off the special grease applied to the area of the shift lever marked with an asterisk (*) when you disassemble it. 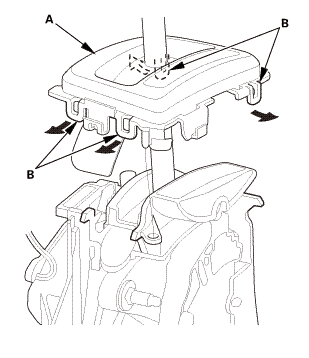 Pull down the shift lever ring (A). 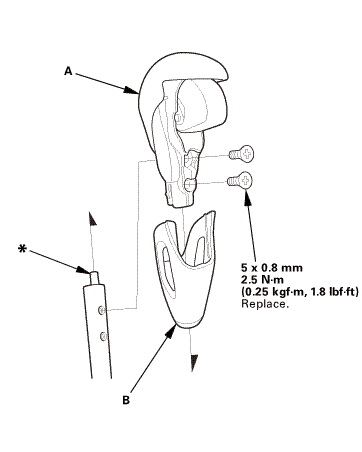 Wrap the end of a flat-tip screwdriver (B) with tape, remove the shift lever knob ring (C). 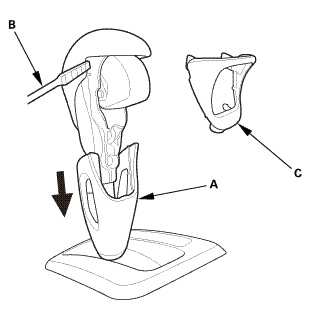 Remove the shift lever knob (A) and the shift lever ring (B). 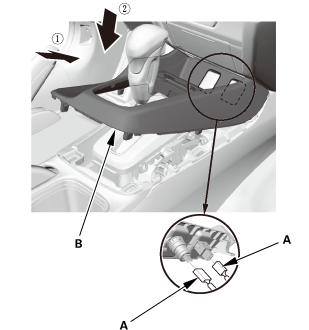 Remove the A/T gear position indicator panel assembly (B) by expanding the four lock tabs (C). Remove the A/T gear position indicator panel light socket (A). 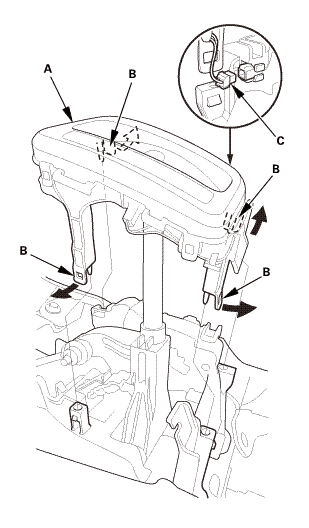 Remove the A/T gear position indicator panel light bulb (B). Unhook the A/T gear position indicator panel light harness (C) from the harness guides. 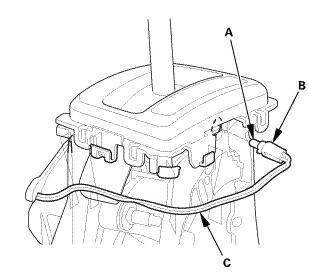 Remove the A/T gear position indicator panel assembly (A) by expanding the four lock tabs (B). NOTE: Do not wipe off the special grease applied to the area of the shift lever marked with an asterisk (*) when you assemble it. 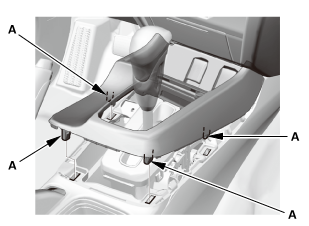 Install the A/T gear position indicator panel assembly (A) by aligning the four lock tabs (B). Install the A/T gear position indicator panel light bulb (A). 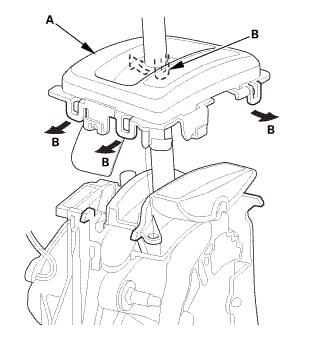 Install the A/T gear position indicator panel light socket (B). Hook the A/T gear position indicator panel light harness (C) to the harness guides. 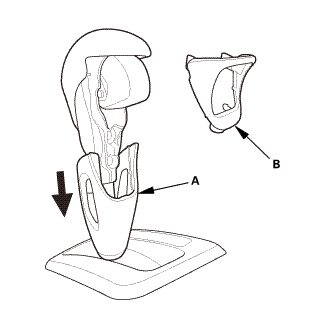 Install the shift lever knob (A) and the shift lever ring (B). 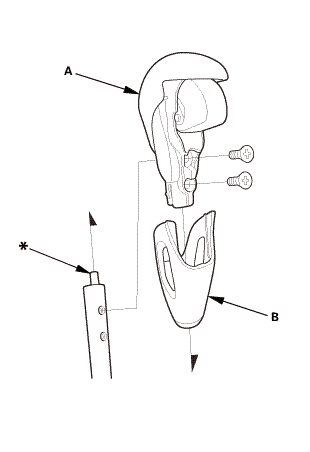 Pull down the shift lever ring (A) if necessary, and install the shift lever knob ring (B). Pull up the shift lever ring to secure the knob ring.